When I’m older, they can call me Nine Toes McGee, on a count of the fact that I changed my last name to McGee at some point. Lost a limb? find it at the ARG Facebook Page! I simply do not understand how people DO that. I only seem to ever stub my toes when the cat gets underfoot and I almost stub my face. My wife, on the other hand, is constantly chipping pieces off the nails on her big toes, or making them go black. I am a frelling mess-on-wheels when it comes to cleaning up (I keep a fifty pound anvil, a shredder, a binder, a rattle-can of spray paint, and a DDR dance mat under my desk) and yet I can usually be aware of my feet enough to avoid hurting myself. Even in the dark! Rule number 74. Kick boards aren’t for kicking. Now that we have that covered, you reminded me of when I broke my foot. The rubber edging of the stairs ripped apart and, being on one foot, I skipped the last four stairs and landed on the outside of my raised foot. Thought I just stubbed it so I went to the store and fixed the stairs. That took me a few hours, so I then figured… “Why does my foot still hurt”. Was off of work for three months. Also I was going to mention that you should put it on ice ice baby… which, in return, reminded me of how dangerous and stupid Vanilla Ice is right now. He has home remodeling show and has his workers in baseball caps doing stupid stunts with major equipment. I only saw one show and saw a guy go to the hospital for a head injury. He still didn’t ask the guys to wear hard hats. Anyways, since you made me think of these, I thought I’d share. To be fair, not many home remodeling shows require the workers to wear hardhats. It just isn’t done. At least not the segments that they show (which can include wall demolition, flooring, working with ceilings. cabinetry, etc.) I think on occasion, Mike Holmes’s show will have hardhats. I may be wrong. A lot of them also don’t require them to wear the masks. And they have professional teams for insulation and mold issues. I’ve watched the Vanilla Ice show once or twice, but don’t remember if he pulls in professional teams for things like that. I remember the one he did of the pool. I don’t know why, but I just remember the damn pool. Mike Holmes always has hard hats when needed and gets pissed when people goof off the harmful way. Vanilla Ice acts like an idiot so I’d put them all in bubbles since no one knows where the danger lies in demolition or remodeling. There should be a special Vanilla Iced Darwin Award. I broke my foot when I was a teenager, I thought jumping off my bed onto a laminate floor would be a good idea! It wasn’t! Who’d a thunk it!? 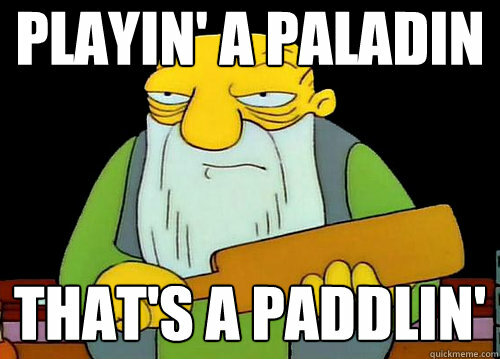 I’m pretty sure that paladins are immune to a paddlin’. I’ve only broken 1 bone in my whole life, and it was my toe. I stubbed it so hard on a damn Ikea chair that I nearly dislocated it too. Did Lynn just lost her freckles out of shock? You should autograph your toe and put it up for sale on Ebay. Many individuals (myself included) may be interested in purchasing it if it’s in good condition. Like my dad would always advise – Walk it off. WALK IT OFF!!! 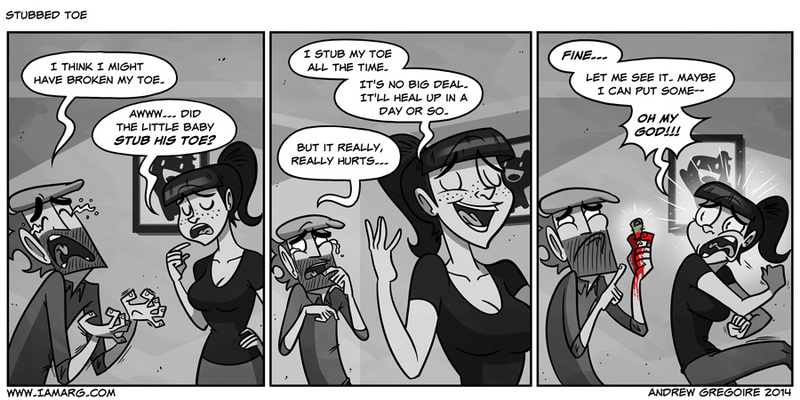 I have terrible circulation in my toes, so it doesn’t actually hurt when I stub them.